Smith's ability to play on defense and also at forward when needed has enabled him to stay in the lineup, which is a far cry from last year when he was send down to Hartford (AHL). 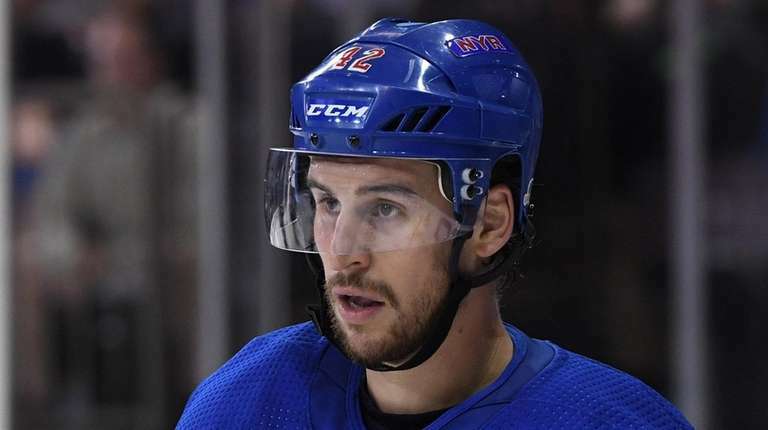 TORONTO — A year ago, Brendan Smith’s season was over already, ended by a broken hand suffered punching a teammate in a fight in practice at Hartford (AHL). These days, he is shuttling back and forth between forward and defense for the Rangers, but whatever position he is in, he is playing well enough that coach David Quinn feels the need to have him in the lineup. To be fair, having a fourth-line winger generate the second-most “Grade A’’ scoring chances over a 10-game span probably says more about how weak the rest of the offense has been, as opposed to how good Smith has been. And Quinn acknowledged as much. But still, just being in the lineup night in and night out is a huge improvement for Smith over last season, when he played so poorly for the Rangers that he was waived — in the first year of a four-year, $17.4 million contract signed in the summer of 2017 — and then sent down to Hartford. This season has been quite the comeback season for him, though he said all hasn’t gone exactly according to plan. “I think I would rather be in a playoff spot,’’ Smith said when asked if his bounce-back season was going well. “But if you’re just talking individually, I think it’s going pretty decent. Obviously, I’m playing a little bit of forward, but I’ve been doing alright there, and then when I’m playing defense, I’m playing pretty well, so I’m happy in that aspect. Smith, who turned 30 on Feb. 8, said a year ago he had lost all confidence in himself. It was widely reported that after a great playoff spring in 2017, following his trade deadline acquisition from Detroit, he had signed the big contract, gotten married, and arrived at camp out of shape. He admitted being in better shape at the start of camp last fall, but said there were other things that played into his revival, including the hiring of Quinn as coach to replace the fired Alain Vigneault. Quinn had a long history with Smith, having recruited him to play hockey for Boston University while he was an assistant coach there, and the coach not only gave him the benefit of the doubt, but Smith said the defensive systems were different as well, as well as the opportunity to play in different situations he hadn’t gotten a chance to the year before. Everything combined — along with the support of his wife and family, Smith said — made the difference for Smith from last season to this. One of the situations Smith finds himself in is that role where he plays that hybrid forward-defenseman role. Often he starts out as a fourth-line left wing, but plays defense in penalty-killing situations. And, of course, he’s available to play defense full time in the event of an injury or major or misconduct penalty to one of the other defensemen in the lineup. Quinn thinks the hybrid position could be a new role for Smith to play. The 6-2, 195-pound Smith had been a forward as a teenager and was a forward when Quinn was recruiting him, before he switched to defense. Smith isn’t thinking about being a forward/defenseman in the future, but he is thinking about the future. He said he enjoys working with and teaching the Rangers’ young defensemen — his on-and-off partner, Brady Skjei, 24, as well as Tony DeAngelo, 23, Neal Pionk, 23, and the recently called-up John Gilmour, 25. At the same time, he’s working constantly on getting better himself, to try and put himself in a position to solidify a spot in the lineup every night. With the Rangers loading up on young defensemen, that will be a challenge for Smith going into next season. “You just look after your own self by trying to be the best player,’’ he said, “and by the end of the day, hopefully . . . the better player should play, no matter if it’s a young guy or an old guy. When I came into the league, it was, you had to be better than the older guy, because if you were equal, you weren’t playing.